17" TRD 5-lug Tundra wheels with BFG AT LT285/70R17E tires. Part of being The Tire Meister means that I need to have wheels on which to mount the treads I’m evaluating. Unless I want to constantly remove my proven, primary tires, extra wheels are desirable. Extra wheels make for better, more consistent tire testing, and back-to-back swaps of mounted tires is an easy process. Mounting & balancing tires and wheels is not easy, nor inexpensive. I’m not an aftermarket wheel aficionado—quite the contrary—I like perfectly fitting, relatively inexpensive, OEM aluminum wheels for my 4x4s, and using the same wheels eliminates a testing variable. With the assistance of Craig’s List, finding take-offs from dudes who want “Lighter, Stronger, Faster” wheels, is relatively easy—as long as you have a current model truck that guys are actively modifying. (Are there actually lighter and stronger rims for the second generation Tundra than the 17-inch forged aluminum OE wheels?) This said, 17-inch 5-lug Tundra wheels are not that common, but the big wheel craze is a live-and-well, so with some patience take-offs can be found. 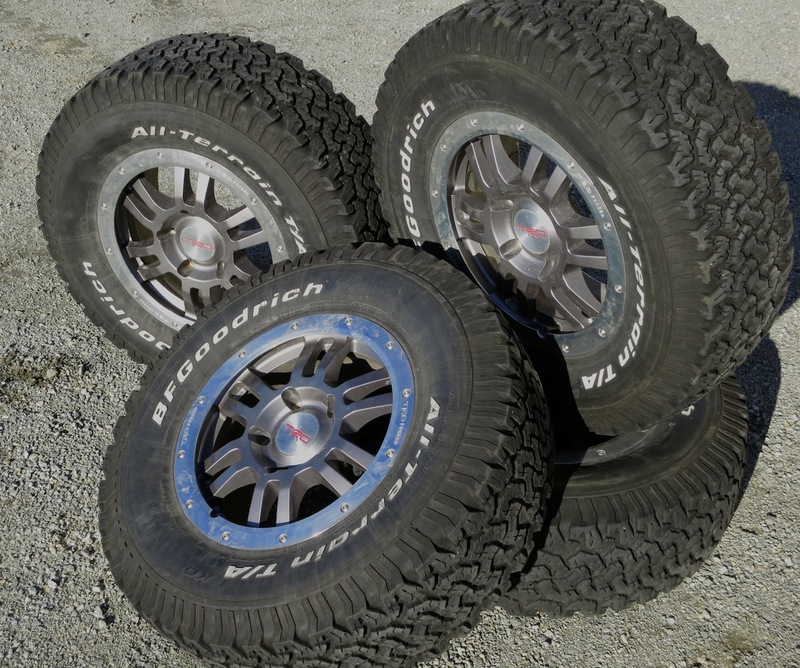 Finding a set with worn tires, or no tires, seems to be the key to reasonable prices. Many want $1500 for their almost new take-off TRD 17-inch Rock Warrior wheels and BFG AT tires. I’m not a big fan of the BFG All-Terrain so there’s no way I’ll pay that kind of money. The set pictured here was not located on Craig’s List, but on a Tundra forum. A guy posted a feeler several weeks before he planned to install 20-inch wheels and 35-inch tires on his Tundra after a 6-inch lift. He was in the same state so I sent him a PM. Turned out he was also in the same metro area, what are the odds? I made him an offer, he accepted, and we waited for his truck to be lifted. A couple weeks ago I purchased his TRD Rock Warrior 17-inch wheels, lug nuts, and locks, along with well used original BFG All-Terrain tires.